Episode two opens with two Brotherhood assassins about to kill Flynn, when Eve intervenes and knocks their heads together. Jacob and Ezekiel help Flynn to stand up and Eve notices how badly Flynn has been wounded. Eve offers to treat Flynn but he says that because it is a magical wound, it cannot be treated. Jacob calls out that they need to go and find Cassandra but Flynn informs the group that Cassandra is the one who let them in. Flynn then takes a swig of Bathsheba's oil of healing, which slows the bleeding but does not stop it. Flynn says that it will slow the bleeding long enough for them to find Charlene. Eve says that she passed Charlene earlier and was instructed to meet her deep in the library by the corridor of doors. Flynn takes off running with the others on his heels. Lamia gives the order for the Brotherhood to pack up as much as they can. Cassandra questions if this is all necessary and Lamia points out that all of these items could be used to help the public. Cassandra is at least somewhat skeptical that the Brotherhood is on the side of good. Lamia assures Cassandra that they are going to use the library's powers to change the world. Flynn keeps running and when Jacob asks how big the library is, Flynn says that it is as large as they need it to be. A bell suddenly starts to toll and the library begins to fold in on itself, as Flynn yells no. Eve grabs Flynn and they take off running in the opposite direction. Lamia gives the order for everyone to get out and says that the library exists in its own pocket dimension and that the first librarian just cut the anchor chain. Jacob is counting down the bells and Flynn says that he has never been this deep in the library before. Flynn adds that Charlene will know what to do but Eve says that she is not coming. They find a secret door and leap through it. When Flynn tries to go through the door again, it leads him nowhere and then the door suddenly disappears. Ezekiel questions where they are because it's daylight now. Eve looks at her GPS and announces that they are in Oregon. They head for the road and meet up with Jenkins, who seems to have been waiting for them. On the drive, Jenkins says that they are not taking Flynn to a hospital and instead drives them to a different location. Eve again asserts that Flynn needs a doctor but Jenkins says that wounds by Excalibur don't heal. Flynn is shocked that Jenkins knows about Excalibur and questions where they are being lead. Jenkins turns on the lights and reveals that they are in the library. Flynn collapses on the ground. Flynn wakes up to find out that they have used duc tape and glue to try and seal the wound. Flynn gets up and calls out for Judson and Charlene and Jenkins explains that this is an annex of the library. Jenkins adds that Judson has cut ties of the library to the physical world and that all they have is this room, which will give them access to the information, with no way in or out of the main library. Jenkins calls Judson rash and says that the library is best used for research and not gallivanting around. Flynn says that he should have seen Cassandra's betrayal coming and wonders why Judson didn't warn him. Eve suggests that Judson trusted him to figure it out on his own. Flynn says that people are dead because he just wasn't good enough, as he makes his way up a flight of stairs. Eve points out that Flynn is reopening his wound but Flynn says that it doesn't matter because it is a magical wound; it means that it will never heal. Even finally tells the others that if Flynn keeps bleeding, he will be dead in 24 hours. Cassandra meets with Lamia and Dulaque and he points out that the librarians will go to any lengths to keep magic out of the world. Cassandra asks about being cured and behind her back, Lamia raises a knife as if to stab her, as Dulaque says that when the key is joined to the lock, they can cure her and magic will be returned to the world. Cassandra asks Dulaque to save all of the people who science cannot save and Dulaque assures her that this is what she is there to do. Dulaque sends Cassandra off for a nap and Lamia confronts him about why she was not allowed to kill Cassandra. Dulaque explains that even with Excalibur, it will be difficult to access the lock and having even half a librarian (read: Cassandra) will prove useful. Outside the satellite site, Eve tells Jenkins that since she is new to this that she really needs Flynn to get it together. Jenkins tells Eve to pull Flynn together because it is her job as a guardian to keep him in one piece mentally and physically. Eve points out that she didn't do a good job but Jenkins is not sympathetic, saying that this sort of thing happens to Guardians all of the time. Jenkins adds that Flynn is drowning because he has lost both Judson and Charlene and sends Eve inside to save him. When Eve re-enters the satellite site, she finds Flynn studying, trying to find a way back to the library. Eve questions if this what they should be doing and Flynn argues that the library has tools and resources that they are going to need to fight the Brotherhood. Eve points out that since they have been together Flynn has only used his brain and that is why Judson chose him. Eve adds that if finding the library were the right thing to do, he would be doing it and reading about it. Eve suggests that Flynn not go back to hiding in books the way he did before he became the librarian. Flynn says that he is going to be dead tomorrow, so Eve asks how Judson and Charlene would want him to spend his last day and Flynn replies that they would want me to save the world one last night. Suddenly Flynn say key and gets up. Flynn starts rambling about how Lamia called Excalibur the key. Flynn says that a key goes into a lock and Flynn realise that they need to find the stone. The team realises that they need to head to London, England. Ezekiel and Jacob are stunned that they are asked to come along but Flynn points out that the library is gone, as well as Judson and Charlene and he is bleeding to death. The team are now in the tower of London and Flynn tells Eve that they need a compass to track down the stone and because it was made of pure magic that it should attract any other magic item in the city. Flynn decides that Ezekiel needs to steal the stone of Maraquesh and snarks that he knows now why the library chose him. Eve is now pushing Jacob around in a wheelchair and she rams him into the display case holding the stone as a distraction, setting off the alarms. Ezekiel uses the distraction to steal the stone and take it outside to Flynn. who wraps a string around it and says a magical phrase, turning it into a compass. The stone starts to pull Flynn and the group begins racing after him. Dulaque is escorting Cassandra through a stone tunnel saying that he has found the chamber that holds the stone but unfortunately, it is surrounded by magical traps. Dulaque reveals that the royal family has been hiding the location of the stone for centuries. The stone has led the Librarians to Buckingham Palace. Ezekiel says that there is going to be a charity benefit tonight at the palace and offers to forge them an invite. Eve is stunned that they are expected to break into Buckingham palace and rants asking if the Vatican and the White House will be next. That night, the librarians are in line to enter but Eve is notably missing. They hand over their invitations but security steps aside to examine them, causing Flynn, Jacob and Ezekiel to worry whether their fraud has been discovered. Eve makes her way down the stairs, announcing that Flynn et al are with her and on orders of the Director of Counter Terrorism. The guards then let them in to the gala. Flynn tells the group to look for a secret passageway because the royal family must have created an access to get to the stone. Eve then explains the security to Flynn and points out one guard that seems out of place. They realise that the guard is watching the secret door. Dulaque is also at the party and he is chatting with an ambassador. In the tunnel Lamia struggles to make her way through a stone wall, followed closely by Cassandra. They finally make their way to the stone which is surrounded by a metal cage. Lamia gives the order for the cage to be cut through but when one of the men touches it, he instantly disintegrates. Lamia finds a key based on ancient Greece and Hebrew and Cassandra starts to crack the code. At the party, Ezekiel sends a message to security about an alarm being set off and they move away from the secret passage way. In the tunnel, Cassandra has managed to figure out the code and the metal cage disintegrates. Lamia, who is now holding the sword and wearing the crown, orders Cassandra places in a cell. Cassandra is shocked and points out the Brotherhood's promise to help people and Lamia says that they are by bringing magic back to the whole world all at once. Lamia adds that technology will end and magic will return but the catch is, the Brotherhood will control it. Lamia asks for the magic to return and puts Excalibur in the stone. Flynn, Jacob, Eve and Ezekiel make their way through the tunnels. All of a sudden, the lights flash and Flynn realises that the sword has rejoined the the stone. At the party, Dulaque's eyes flash a bright blue. Ezekiel starts to talk about pilfering the wine, causing Flynn to realise that the wine cellar hides another secret passageway. Flynn tells the group that the Brotherhood tunneled in from the side. Flynn et all watch as Lamia tells the group that they are moments away from returning magic to the world. Flynn tells the group that they are facing a group of trained killers and one of them has the most powerful weapon on earth and asks for ideas. Cassandra calls out that she has an idea from her cell but Jacob says no thanks because she has already sold them out once. Flynn says that Cassandra had her reasons and instructs the group to release her. 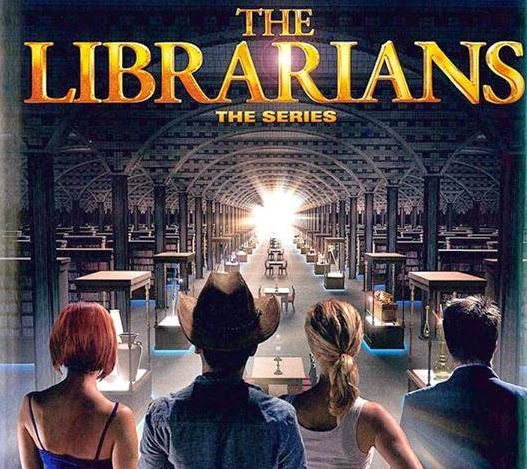 Cassandra lays out a plan and Flynn more fully explains it and the team gets to work, just as Lamia realises that the librarians have arrived. The group starts their assault and Lamia picks up a sword. Flynn tells Lamia to give him the crown and stop this, as the group continues to fight. Lamia says that magic is returning to the world and flowing out through the ley lines. Flynn is adamant that this is power he cannot allow her to have. Lamia is not impressed by the force Flynn has assembled and Flynn says that librarians fight with knowledge, science and electro magnets. When Flynn holds up the magnet, the crown flies off of Lamia's head an attaches itself to the magnet. Flynn then calls to Excalibur and it fights off Lamia before landing in Flynn's hand with a high squealing noise. Flynn falls to his knees holding the sword, telling Eve that Excalibur is dying because most of the magic has gone back into the earth. Flynn then hands over the sword to Cassandra saying that it can save her. Flynn says that it's okay because Judson and Charlene are gone and Excalibur is dying. Flynn dies as the group watches. Cassandra touches Flynn with the sword and he sits up suddenly to discover that his wound is healed. Flynn is shocked and tells Cassandra that it was supposed to be for her and she says that he has already saved her. Flynn picks up the wimpering Excalibur from the ground and tries to soothe it. He then lays the sword gently on the stone and it melts into it and disappears. The group is back at the satellite site and Jenkins hands Cassandra, Jacob and Ezekiel their airline tickets saying that it's not fair to involve them in this life any longer. Ezekiel and Jacob shake Flynn's hand goodbye and Cassandra wonders about returning to their lives after what they know. Flynn takes Jenkins aside to talk about returning the library and Jenkins reveals that he tried everything but the library is now adrift from this world. Jenkins declares the library lost. Flynn heads inside the satellite site and sees an apparition of Judson. Judson says that his time is done and that Charlene is with the library. Judson tells Flynn that his time is done and that Flynn is ready to move on. Flynn says that he never had a father and Judson replies that he never had a son. Flynn declares that he is going to find the library and that he is the librarian. Judson says that the Serpent Brotherhood has released a lot of magic into the world and are still out there leaving Flynn with no time to search for the library. Flynn says that it cannot happen if he tries to do it alone. Judson disappears as Eve enters and Flynn says that he is in charge because he is the librarian. Flynn declares that it is time he started making up new rules and rushes outside to catch up with the group. Flynn asks the group to open their envelops and they are all invitations to become librarians. They all head back into the satellite site and Flynn says that Jenkins will supervise their training as librarians and they will have access to the archives. Jenkins is not impressed with the changes, so Flynn reiterates that he is in charge and things have to change. Eve argues that the group is not qualified and Flynn promises to still handle of the big stuff and it will free him up to find the library. Flynn tells the group that he is offering them a life of saving the world, mystery, loneliness and adventure. Jacob is shocked that the invitation is extended to Cassandra and Eve vouches for Cassandra. They all agree and Cassandra rushes forward and hugs Flynn. Flynn tells them that he will be back to check on them in a few weeks and advises that they try not to die. Eve walks Flynn out and she says that they need to find them a guardian because Jacob is the only one who can handle himself in a bar fight. Flynn says that he has already found their guardian and adds that with Judson gone and the library gone, if something happens to him, that group is the future. Flynn tells Eve that he trusts her to protect them and that he believes the library chose Eve to be their guardian. Eve grabs Flynn and kisses him and she tells him to come back alive. Flynn starts to stammer and says that they will call or text and is clearly overwhelmed. Inside the satellite site, Eve interrupts Jenkins who is talking to the new recruits and instructs him that he is to make himself useful. Jenkins shows him the clippings books which adds new pages of a new mystery. Okay that was episode two. Clearly, we are not going to see Judson again and this was Bob Newhart's swan song in this series. I am really saddened by this because Newhart was absolutely the highlight of this show even though he appeared so briefly in these two episodes. We now have John Larroquette in his place and while I love Larroquette, he is not Newhart. We will have to see where this character goes. Alright, it's a good thing we have Eve because with Charlene gone the only other female representation is Lamia and Cassandra. Yes, it's great that Cassandra is as smart as the others but she is also naive in a way that they aren't. They have also made her fragile by giving her a tumor in her brain. Then we have Lamia who is the evil woman of colour and we have yet to learn why she is in the Brotherhood or what her motivation is. If they don't give her some characterization soon, Lamia is going to be nothing more than a weapon. I really did not like the fact that they turned Ezekiel into a thief. It's rather telling that he is the only librarian that uses his skills that way. It is not good representation. Having Flynn look for the library is a good excuse to explain his absence in the story. I for one won't miss him and will much prefer watching Eve lead the team, that is, if she is actually allowed to do so.The show is camp enough without Flynn's third rate Doctor Who act.